We are all made up of many different types of cell (skin cells, nerve cells, liver cells etc) each performing a specialised function i.e. beta islet cells of the pancreas produce insulin – each individual cell works in harmony with other cell types so that we can do everything we need to do to survive as a species. These cells, each with a specific structure and purpose, are termed differentiated – there are approximately 210 types of cell in the human body. But where do all these different cells come from? Every cell in your body can be traced back to a stem cell. Before a fertilised egg can implant into the lining of the uterus it is already producing stem cells by continuous division, this process begins as soon as the sperm and egg meet, wasting no time in creating enough stem cells to grow an entire human! Stem cells have two major defining features: 1) the ability to self-renew (it can reproduce itself; immortal), and 2) the ability to produce offspring of different functional cell types. Normal cells are only able to clone themselves a finite number of times before the genetic material in the cell becomes damaged, whereas stem cells can continue to produce new copies of themselves indefinitely. Each cell in your body contains a nucleus which houses genetic information (DNA) which is almost identical in each of your cells; however not all of the genes in a cell are always active. Genes can be “switched” on or off dependent on the conditions the cell is grown in. The unique combination of genes which are switched on or off in the nucleus of each cell type determines the proteins able to be made by the cell and therefore it’s overall structure and function. As such, stem cells with no additional function over reproducing are able to give rise to cells with a plethora of functions allowing a few stem cells to give rise to a new organism in its entirety. N.b. Stem cells can be described as pluripotent: pluri = think similar to plural; potent = potential; therefore pluripotent cells are those with the potential to become more than one cell type. FIgure 1: Basic schematic showing differentiation from a stem cell. A stem cell is able to both self-renew and give rise to differentiated cells. Progenitor cells divide a finite number of times before differentiation to amplify the number of differentiated cells formed from an individual stem cell. It is worth remembering, however, that stem cells are not only present in embryos – far from it! A lot of early observations and descriptions of stem cells came from the study of renewal tissue – possibly the most notable example of this is our skin. The skin is the largest organ of the human body and, as we all know but try to hide, it sheds. However, because skin is not a “finite” resource new skin cells are able to replace the dead cells we have shed keeping us coated in a protective layer of skin. The outer layer of skin (the epidermis) is composed largely of keratinocytes which must be constantly replenished. 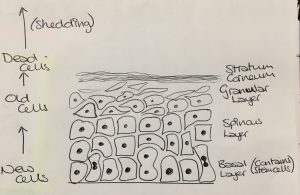 The stem cells are located in the deepest (basal) layer of the epidermis continuously producing more keratinocytes which then migrate up through the layers of the epidermis as they mature, taking nearly a month to move from the basal layer up through the epidermis to the stratum corneum where they shed. p.s. a fancy word for ‘shedding’ is desquamation the use of which makes you sound instantly more interesting. Figure 2: Simplified diagram illustrating the process by which skin cells termed keratinocytes are continuously generated in the epidermis. So, now we know what a stem cell is – what can we use them for? Many people believe that stem cell research is of great importance because it is hoped to lead to treatments for illnesses which are currently incurable. In the UK (as with many other countries around the world) the success of our healthcare system brings with it a burden – due to the incredible advances in healthcare an increasing number of us are surviving well into old age. Our bodies are not designed to live to the ripe old age of 80 and inevitably body systems begin to wear out, leaving us vulnerable to illnesses which are termed degenerative diseases (the term encompasses diseases due to both normal bodily wear and lifestyle). Eventually our cells lose the ability to suitably replace themselves and we begin to show signs of age – as part of the normal aging process our skin becomes thinner, we may become more forgetful, and many of us will end up needing glasses. With the aging process comes an increased likelihood of infamously cruel and debilitating diseases such as Alzheimer’s, Huntington’s and Parkinson’s, as well as Amyotrophic Lateral Sclerosis (ALS) which I hope everybody remembers from the Ice Bucket Challenge! 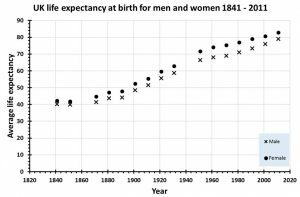 Figure 3: Graph displaying the change in UK life expectancy from 1841 – 2011 for both men and women. Graph created in Excel using data from the Office of National Statistics. If you think of your body as a car, you wouldn’t drive a car continuously for 80 years – parts get worn and need to be replaced, servicing clears out the build up of any residues in the filters, and the fluids are kept topped up and changed regularly. It is incredibly difficult to replace parts of the human body – if I break my suspension bush I get a new one fitted, if I break my arm and the doctor suggests fitting me with a new one I’ll be more than slightly concerned. However, is replacing human body parts really that far fetched? One day could we prevent the aging process by seeking out and replacing faulty cells as one would maintain any other machinery? 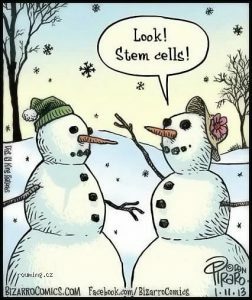 This is where stem cells really come into their own. Current methods of replacing organs rely on organ donation – not only does this raise the issue of waiting for someone to die and the significant gap between demand and supply, but crucially tissue must be matched exactly and even then the recipient must take immunosuppresants daily; even a common cold which would be relatively harmless to you or me could be devastating and wreak havoc when the warriors of the immune system are suppressed. Immunosupporesants are required because in the case of organ transplant, the receiving body will detect surface markers on the new organ which mark it as a foreign body, the immune system will therefore react in exactly the same way as it would to a viral or bacterial infection and attack the transplanted organ. However, if we could use the patient’s own cells to grow an organ in the lab we would then be implanting tissue with the patient’s own unique markers and there would be no need for a lifetime sentence of immunosuppressants. By growing stem cells taken from the patient’s own body (for example from bone marrow) and then manipulating them to differentiate into the desired cells we could in theory use them to “build” new tissue, or implant them into the body to replace damaged cells. One example of this is the use of implanted stem cells to replace dopamine-expressing neurons in the brain which are lost to Parkinson’s disease – this is currently a field developing very promising research, more information on which can be found here. Our own Professor Anan Shetty working alongside Professor Seok-Jung Kim, Director of Cell Therapy at the Catholic University and St. Mary’s Hospital, Seoul, South Korea, has pioneered a technique for cartilage repair using stem cells to repair arthritic joints. This technique is far less invasive than a full knee replacement and as such time in hospital is significantly shorter with less intensive rehabilitation than that which would follow a knee replacement. While at the moment growing a new organ with an incredibly complex mix of different cell types working in harmony is not possible, research is currently ongoing to release the full potential of stem cells for clinical applications and it is hoped that what would once have been confined to science fiction books will one day (fairly soon) become a feasible solution to a plethora of problems the world over.